How is it possible that 20 percent off all plastics pollution in the Great Lakes is from microbeads? The tiny plastic bits are now in so many cosmetic products that they are washing into our water systems, threatening fish and birds. Today, we look at the environmental dangers on your bathroom counters. There are hundreds — maybe even thousands — of health and beauty products on shelves right now that contain a special ingredient commonly known as microbeads. They're the tiny, gritty particles in everything from face cream to tooth paste, that are supposed to help scrub and exfoliate your skin and teeth. And if you've never stopped to think about those little flecks in your toiletries... you're hardly alone. But they've been the subject of much thought, and study and consternation, by environmentalists across North America. 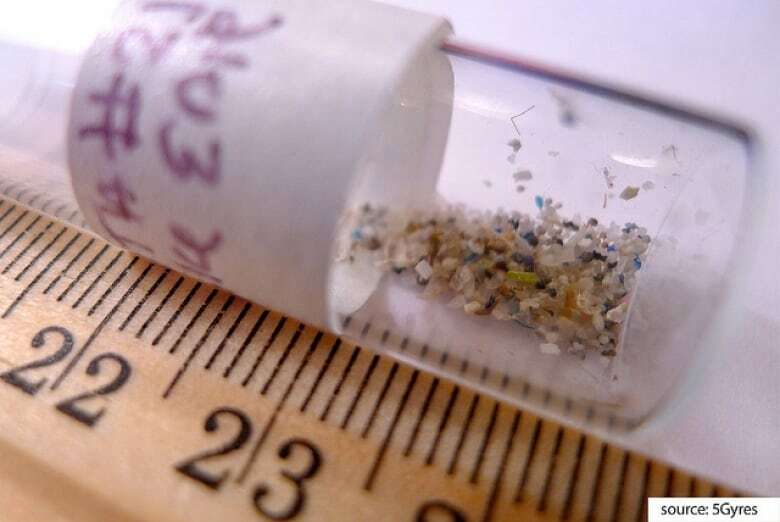 Microbeads are made of plastic. And after that quick scrub or brush in your bathroom, they go down the drain, and into the environment. Two American states, Illinois and New Jersey, have been sufficiently concerned by microbeads to ban them already. In Ontario, a similar bill has had its second reading. And last week, the federal NDP used its Opposition Day to debate a motion to list microbeads as a toxic substance in the Canadian Environmental Protection Act. Megan Leslie is the NDP's Environment critic and Member of Parliament for Halifax. Darren Praznik is the President of the Canadian Cosmetic, Toiletry & Fragrance Association, or CCTFA, a Canadian association for the personal care products industry. It represents over 150 companies. Last week he sent a letter to the Minister of Environment Leona Aglukkaq about the issue of microbeads. Darren Praznik was in our Toronto studio. After talking about what politicians, and industry, should do about microbeads.... you might be wondering how consumers should be dealing with the issue. Adria Vasil is the author of the "Ecoholic" book series, and an environmental columnist with the Toronto-based NOW Magazine. Would you change your consumer habits to stop using products with microbeads? Tweet us @thecurrentcbc, Post on our Facebook page, or email us from our website. This segment was produced by The Current's Pacinthe Mattar and Sujata Berry.